To look for businesses by size and location, use Reference USA. 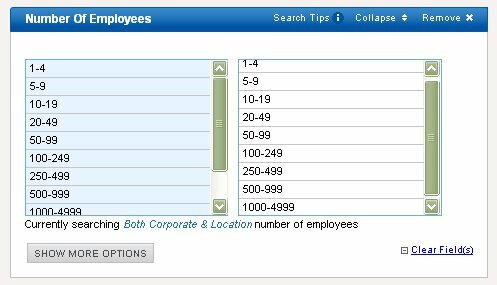 Under Business Size you can choose from Sales Volume or Number of Employees. Choose the latter. Once you've done that click on the numbers that are relevant to your search. If you are looking for a business with <5,000 employees choose everything up to 5,000 (i.e. 1-4, 5-9, 10-19, and so on). Once you've made all your selections based on geography and business size click on the green View Results button to see the businesses or the blue Update Count button to get a number of businesses. NOTE: I wouldn't take these numbers as being exact numbers but rather pretty good estimates.